Like almost everything else in my living room project, I finally came to the conclusion I was going to have to make it myself. I guess my tastes are just too weird to run with the current decor trends. 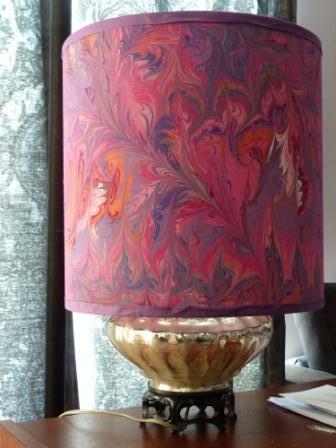 Thankfully, I found out that lampshades are not horribly difficult to make. Much like with my couch tufting, the hardest part is tracking down the materials and all the necessary tutorials. Since my couch DIY was so helpful, I thought I’d once again type up all the gory details for those interested. 1. Lamp Base: You’re welcome to use one you already own, but you need to have it in hand. It’s important to know how big your lamp base is, what it looks like, what kind of fittings it uses, etc. You can’t order your parts to make the shade until you know what the shade is going on. 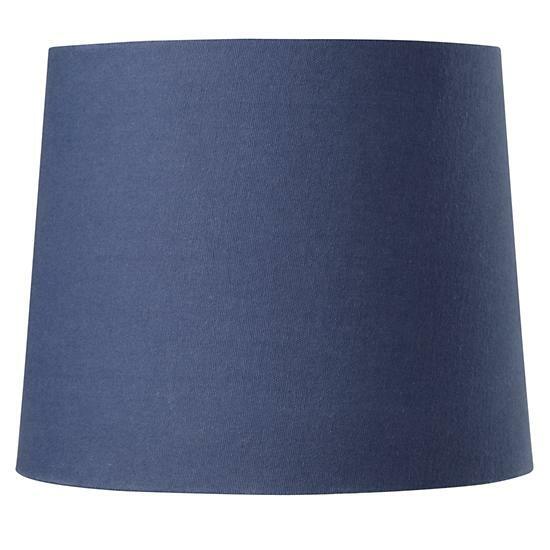 I find most lamp bases in stores currently to be just as dull as the lampshades. Any that are interesting tend to be overpriced. 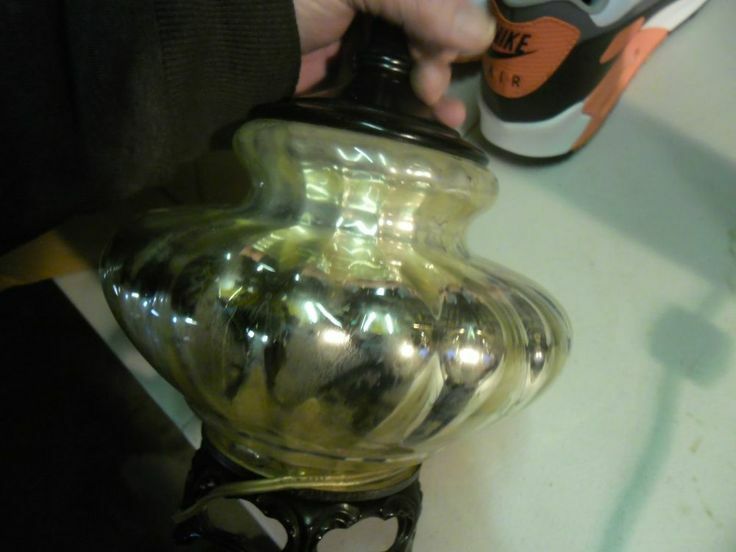 I bought this working antique mercury glass lamp off of Ebay for less than $30 including shipping. 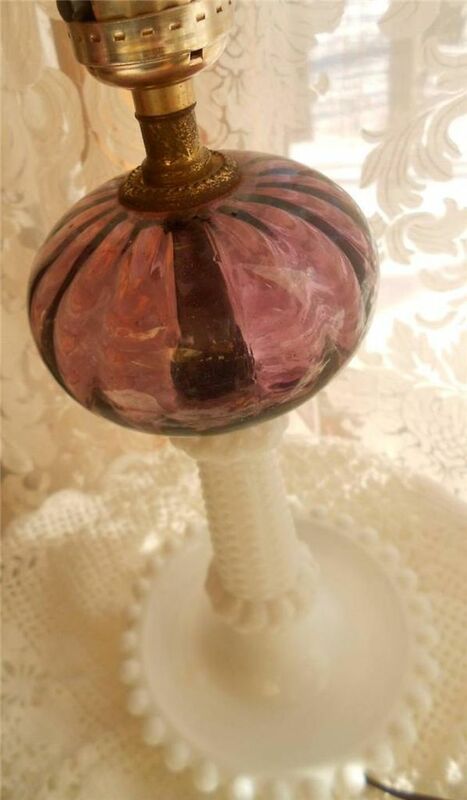 Ebay has tons of cheap antique lamps, many of them still in good working condition. Even if they they aren’t working, you can rewire them with a lamp kit from Home Depot for $12. I got this lovely milkglass base for another project for a mere $15. 2. 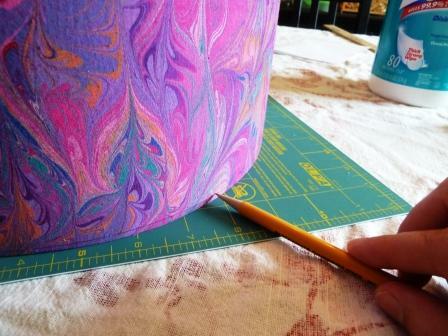 Fabric: There aren’t many limitations on what kind of fabric you can pick, which is the beauty of making your own lampshade. The special paper you have to use for the inside of the shade doesn’t stick very well to synthetic fabrics, so stick to natural fabrics like cotton and linen. It’s also best to use a lightweight fabric because if it’s too thick, the light might not shine through well. Still, there are thousands of lightweight cotton fabrics out there. Go crazy. 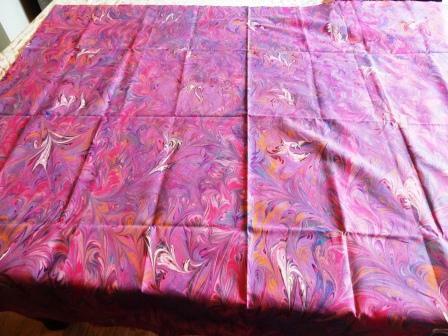 If you are wondering where I got my fabric, it’s a hand marbled fabric I bought from an artist in Oregon named Marjorie Lee Bevis. She was very easy to work with, answering a few questions I had, and even sending me pictures of a couple different samples. It’s even more stunning in person. 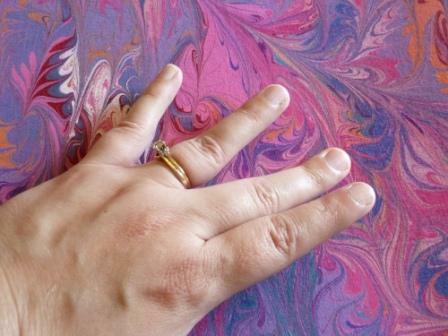 She sells lots of different colors at her website MarbledFabrics.com. Unless you’re making a really large shade, a yard of fabric is probably going to be enough. In the Directions section, I detail exactly how to measure how much you need. If you’re worried, do your calculations before you buy your fabric. My fabric was $42/yd, so I made sure. 3. 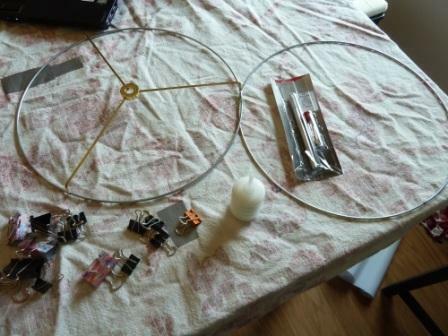 Lamp Rings & Maybe Some Parts to Make Them Work: So, first thing, decide how wide (diameter) a lamp shade you want. I wasn’t entirely sure, so I tried a few different lamp shades from other lamps around my house with the base I was going to use. I liked the look of a shade that was 12 inches in diameter, so that’s what I went with. Almost all of our lamp parts will come from The Lamp Shop. You need to order two lamp rings, one plain bottom ring, and one top one that works with your fitting. This is where you need to look at your lamp base. See what type of fitting it uses so you know what kind of lamp ring to get. Here’s a graphic of the most common types. Scenario 1: You have a harp or a harp/reflector bowl fitting and a finial you want to use that came with your base. Great! You just need to order a top ring for a spider fitter, which is called a washer top just to be confusing. It should be the same diameter as your bottom ring. Scenario 2: You have the bottom remains of a harp, but are missing the harp and/or the finial. This was my problem. You can get a replacement harp and finials at The Lamp Shop, too. Amazon also has a selection. Get your washer top ring, too. Scenario 3: You got nothin’ but a place to screw in a light bulb. Don’t panic, we can work with this. You can do one of three things. The most sturdy fitting is the harp/spider, so you can order a harp base in addition to the harp, finial, & washer top from the previous scenarios. As they are a whopping 28 cents, this is not much of an additional hardship. You could also buy a UNO top ring, but as I didn’t use one, I can’t tell you how to measure what size you would need. If you’re replacing an old UNO shade, measuring it would be a good place to start, though. You could also buy a clip on fitter with a washer top ring and finial, but they slide around and have a hard time clipping to corkscrew fluorescents, so I wouldn’t recommend them, either. However, sometimes with certain lamps you just can’t put a harp base on and they’re your only choice. Pressure Sensitive Styrene: This is the magic lamp making stuff. It’s the slick, plastic-like coating that is on the inside of all lampshades that protects the fabric from the heat of the lightbulb. The Lamp Shop sells it by the foot or yard, and it has an adhesive backing on it. 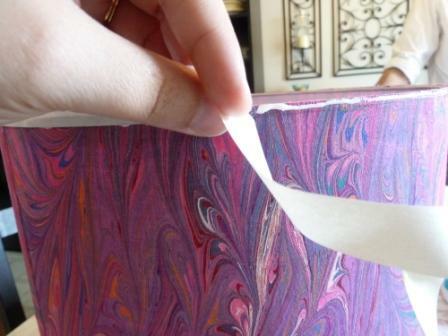 You just peel the paper back off and stick it straight to your fabric, easy-peasy. 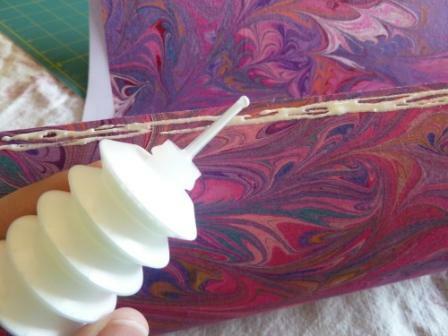 Glue: The Lampshop sells the quick drying glue you need already pre-loaded in an applicator bottle. I wasn’t sure if that amount would be enough for my project, but I risked it. It was more than enough. I could easily make another shade with what is left. Bulldog or Binder Clips: The tutorials suggest using bulldog clips, which you can buy at the Lamp Shop or an office supply store. However, unless you’re dying to own a box of bulldog clips, this could be one of the pricier parts of the project at $15. I found basic office binder clips I had lying around in various sizes worked fine. Plus, if you need to buy them, a box of small binder clips (the size that worked best) runs you $1.19 at Office Depot. You can finish out your shade in two ways. I chose to put a bias tape trim on mine. That’s what that plain purple strip of fabric is on the bottom and top of the shade. Paper tape by the yard from the Lamp Shop, and make sure you buy enough, because I couldn’t find this in any craft store. 3/4 inch is the size you want. 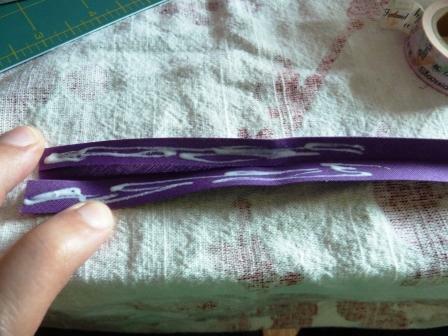 Trim of Your Choice: You can use ribbon instead of bias tape if you like, but double fold bias tape was easy. You can either make your own bias tape, if you want it to be the same fabric you used for the shade, or you can buy premade bias tape. I bought the premade stuff. Not only is it cheap (around $4 at Hancock Fabrics), it comes in many colors, and I liked the look of the solid color contrasting with my pattern. 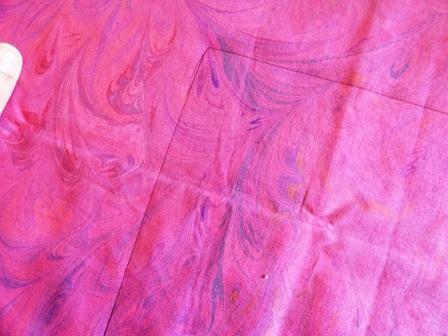 Plus, while making bias tape isn’t difficult, it’s one more step, and it does require a sewing machine. If you feel up to the task, though, there’s a great video tutorial how to do it here. If you want to make a basic lamp without trim, it’s helpful if you buy this molding wand from the Lamp Shop. It helps you tuck the fabric up under the rings. 1. First things first, you need to finalize the exact dimensions of this shade. If you have your lamp base, and you’ve tried other shades from around your house with it, then you hopefully have a good idea now how big a shade you want. You need to decide two things, the diameter (how wide across the shade should be) and how tall you want it to be. 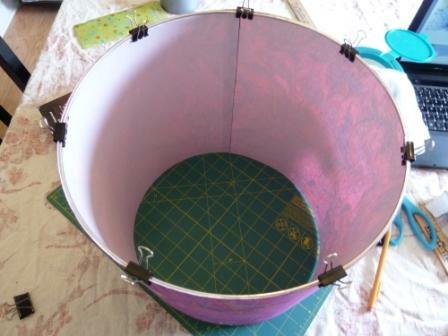 This is a drum shade, which means there’s no slant to it. It will be straight up and down. Just to be all equal like, I decided I wanted a shade 12 inches in diameter and 12 inches tall. That’s kind of a tall shade, but I really liked my fabric, so I wanted to see more of it. Once you have those measurements, keep them handy, because you’re going to need them multiple times. 2. Calculate how much pressure sensitive styrene you need. Okay, folks, we have to use the MATH here, with Pi (3.1416) no less. Get a calculator. Finally, round up to the nearest half inch so we don’t have to mess with all those decimal points. Okey dokey, 38.5 inches is the width of the rectangle of styrene you need to cut out. The height is the height of your lampshade. For me, once again that was 12 inches. 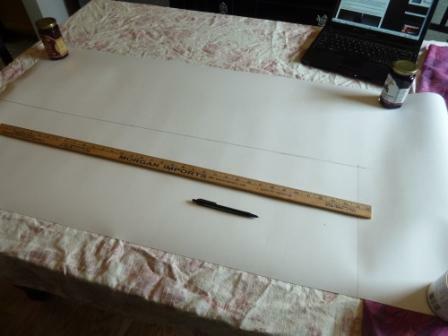 So, I needed to measure out and cut a piece of styrene that was 12 inches by 38.5 inches. If your styrene keeps curling up on you, just grab some jars or cans from your pantry to weigh down the corner. 3. Cut out the styrene. Use scissors or a rotary cutter, whichever you have/prefer. 4. Lay out your fabric and decide which exact piece of it you want to be the shade. That piece of styrene you just cut is the exact dimensions of your shade. 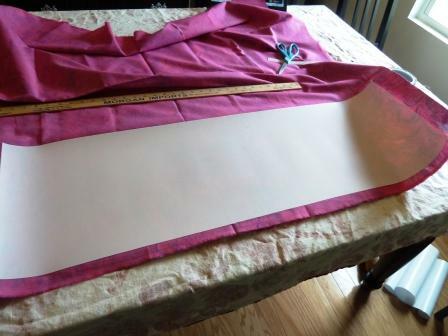 Place it over sections of the fabric to help give you an idea of how big a piece of fabric you are working with. If you’re using a solid piece of fabric, this step is unnecessary, but if it has a pattern, especially like mine, where the pattern never exactly repeated, you want to choose the part of the fabric that’s your favorite. Once you decide where that spot is, lay your piece of styrene on top of it, and trace around it. If your pattern has stripes or other elements you want to keep straight, use your yardstick to help you with alignment. 5. Depending on how you wanted to trim your lamp (no trim vs. bias tape) this is where things begin to diverge. If you opted for no trim, then you need to measure and mark a second line a half inch out from the edge of the styrene all away around it. That’s the line you’ll use to cut your fabric out, but don’t cut it yet! 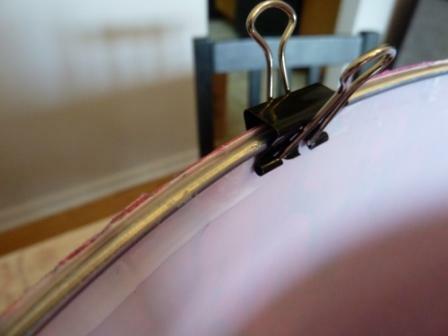 You need extra fabric hanging off in every direction from the styrene. You should also watch this Martha Stewart video, as that’s the kind of lampshade she makes. Since I decided to finish my lamp with the bias tape trim, all the pictures from here on out will reflect that method, which is why I refer the others to the Martha Stewart video. If you opted for the trim finishing method, you don’t need to make that second measure line. Once you’ve traced around your styrene, you’re set. 6. 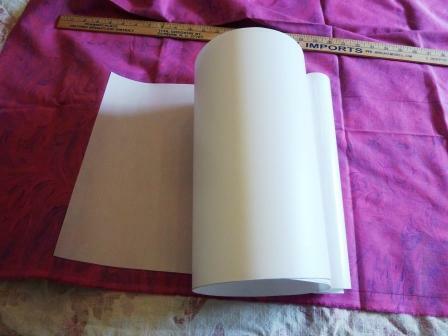 Remove a few inches of the paper backing to expose the adhesive on the styrene. Use those tracing lines you just made as a guide to keep it straight, and slowly stick down your styrene to your fabric. Smooth out lines and air bubbles as best you can as you go. Don’t get scared by this step, the styrene is pretty easy to work with. Before you know it, you’ll have all of it stuck down. Once you have it all stuck, flip it over and double check for any little bubbles or anything that might need some extra smoothing. I had a few here and there. 8. 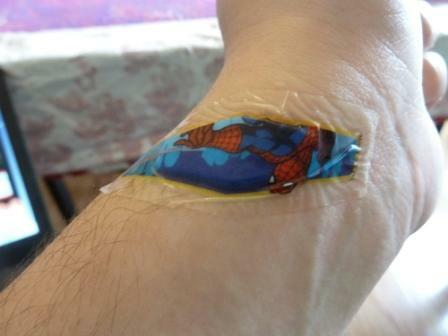 This isn’t a step per se, but Spidey and I would like to take a brief moment here to point out that rotary cutters are SHARP! An absent-minded brush against one might result in bleeding and a momentary halt in your project. 9. Get out your lamp rings and lay them on the table. Make sure they lay flat. If they don’t, you can bend them a bit until they are even all away around. My were in good shape. Get out your binder clips and glue, too. Once you have the bottom lamp ring in, flip the shade over, and repeat the process with the washer top lamp ring. 11. Now that you have both rings clipped in, you want to mark where the seam is. 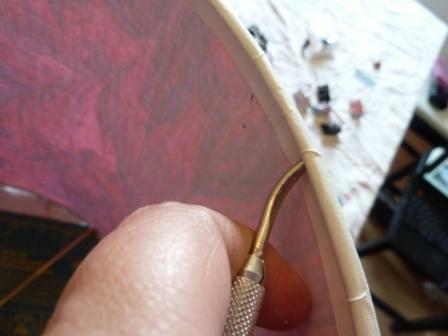 Take a pencil and on the inside of the shade make a few marks where the seam comes together. Also make an arrow or a “T” to designate which side is the top. Your top and bottom rings sometimes are slightly different, so once you’ve marked the seam, you want to keep the the top ring on the side you marked top, and the bottom ring on the bottom. 12. Remove all the clips and and rings. Unroll the shade. 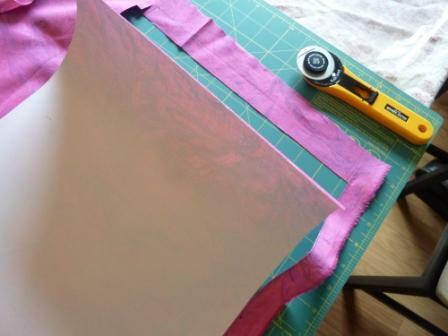 Grab your glue and place some glue on the edge of the fabric that isn’t going to show when you overlap the seam again. Glue your seam together like it was before. Don’t clip it all back together, though. Just set it on your table and weigh down the seam with some heavy books for about ten minutes. 13. Now that the seam is set, we’re going to glue in the rings. Again, depending on no trim/trim this is different. Either way, do the bottom ring first, so looking for your little arrow or “T,” place your shade bottom side up. 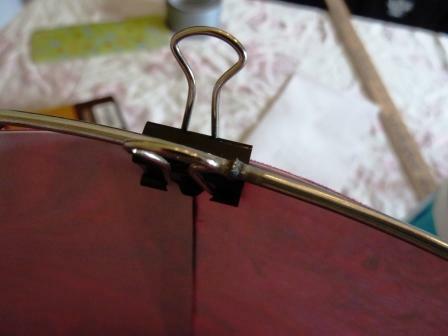 Locate your seam, and place one binder clip there, with the little tab wing up. Locate the weld joint on your bottom ring and place it in the tab wings of the clip and let it just rest there. This helps you glue one side of the ring in while keeping the other side from constantly falling down into the bottom. 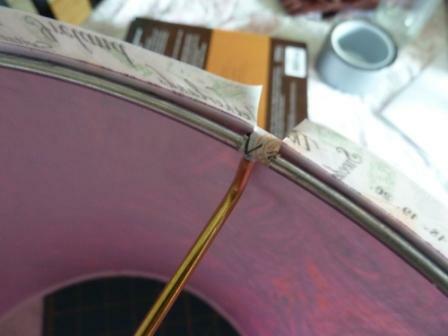 Next, run a line of glue around the rim of the shade, placing the bottom ring along the glue line and securing the ring there with a clip. If some of the glue smears down below the ring, you can just wipe it off. I used some Clorox Wipes as needed. A wet paper towel would probably work fine, too. You’ll also probably need something to wipe your hands on, as they’ll get some glue on them, too, as you adjust the ring all away around. It’s important to keep things neat as possible, or it’s easy to start getting glue on the fabric side where it’s harder to clean off. If you opted for the no trim method, then you’ll have a half an inch of extra material that you can tuck up and around the ring with your molding wand. You might need to add some glue to the fabric, not just the shade/ring. Again, you might want to refer to the video for a visual. Let the ring dry for about ten minutes again. 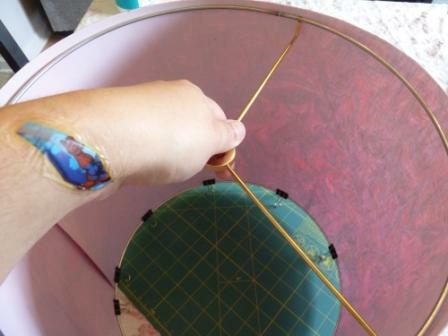 Once it’s dry, flip it over and repeat the process with the top washer ring. 14. If you’re in the no trim camp, you’ve got to be feeling pretty good right now, because you’re done. For the rest of us who like things just a little bit fancy, get out your paper tape. The no trim people had extra fabric to tuck under to make sure nothing frayed at the edges. For us, the paper tape is going to help with that. Plus, then the bias tape attaches to it. 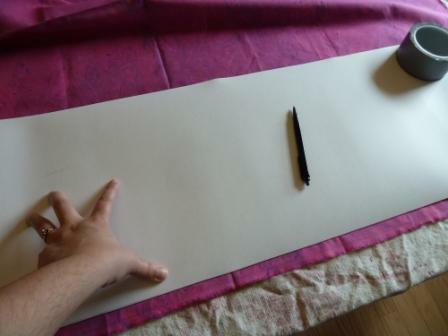 First, with your lamp shade flat against the table, and a pencil as flat on the table as you can, mark a line all the way around on both the top and bottom of your shade. 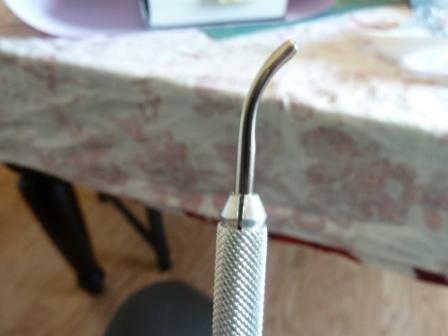 This will give you a remarkably straight line all the way around, about an 1/8″ down from each edge. 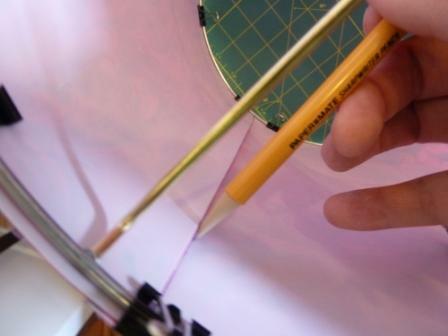 Starting at the seam, and lining your paper tape up at this pencil line, starting gluing the tape all the way around the bottom of the shade. There will be a lot of tape sticking up over the edge of the shade. 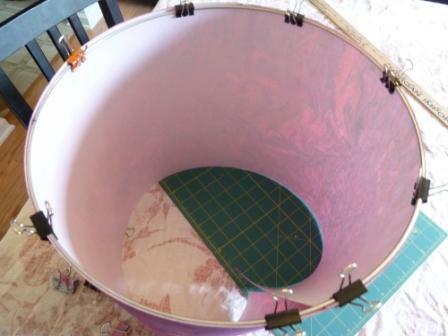 Once you have gone all the way around, then run some glue on the inside rim of the lamp shade at the ring, and start tucking the paper tape under the ring as best you can. The molding tool helps if you bought it. If not, just use your fingers. It doesn’t have to be perfect as the bias tape will cover the paper tape. 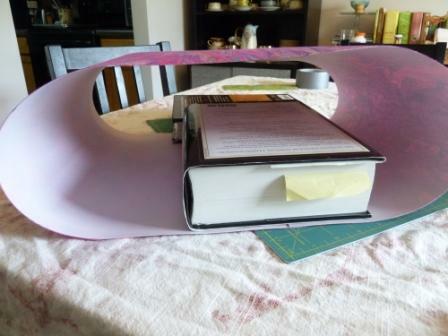 If you remember from our calculations earlier when the shade was flat, it was 38.5 inches wide, which means I needed at least 38.5 inches of paper tape for both the top and bottom, for a total of 77 inches of tape. 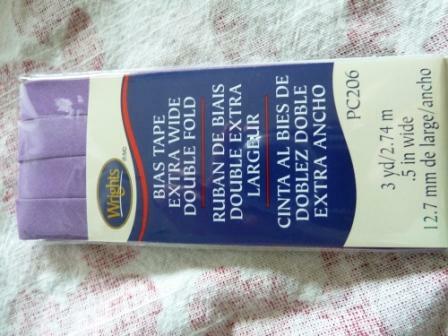 My brain was not working correctly, and I only ordered a yard of the tape, which is 36 inches. The Lamp Shop was generous and gave me a little more than a yard, so I was able to get all the way around my bottom ring before I ran out and realized my mistake. 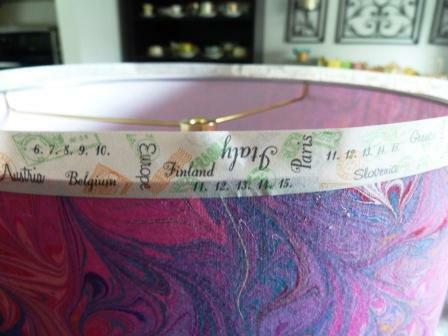 All I could find that was even remotely close to the paper tape in a craft store was decorative Washi tape. It worked fine, but looks a little silly. For the top ring, applying the paper tape is the same, except you’ll have to cut out some little triangles to avoid the spokes of the washer top. 15. The last step is gluing on your bais tape. I’d start with the bottom ring again, just because it’s easiest. 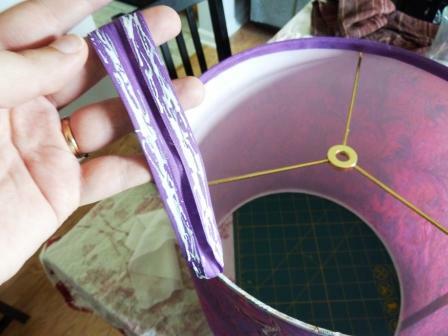 Open up your bias tape and lay it flat and apply glue to the inside for a few inches. Starting at the seam in the shade, glue it on. 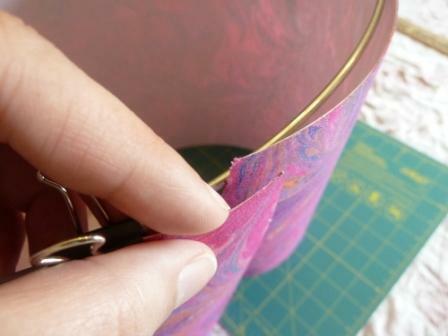 The middle crease of the bias tape should rest nicely along the rim of the shade, acting as a natural guide. Just keep gluing it down a few inches at a time. Once you’re done with the bottom ring, just do the same with the top. When all the bias tape is glued on, you’re done! Whew, finally! 16. 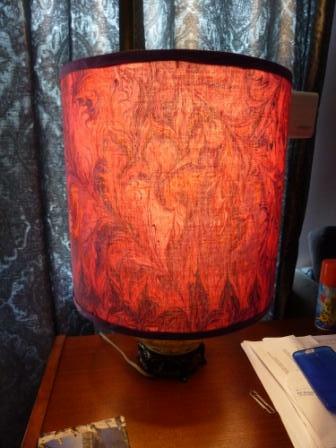 After you’ve let it dry a bit, attach your new shade to your lamp base, plug it in, and admire your handiwork. Fabulous instructions! I am going to attempt this…thanks so much for posting! Glad I could help. Mine’s still going strong, so I can also attest to the durability of the final project.